Volcano Records is deeply pleased to announce the signs of two great musicians, guitarist Gianluca Ferro (Bouncing The Ocean, Doomsword, Time Machine) and drummer Nick Pierce (Unearth,The Faceless, Culling the Weak) together for an awesome international project named Breath Of Nibiru. Volcano Records & Promotion will deliver in Europe the latest album “Skyline Bazaar”, just released by Japanese King Records, and has an option on the upcoming album that will be released next year. 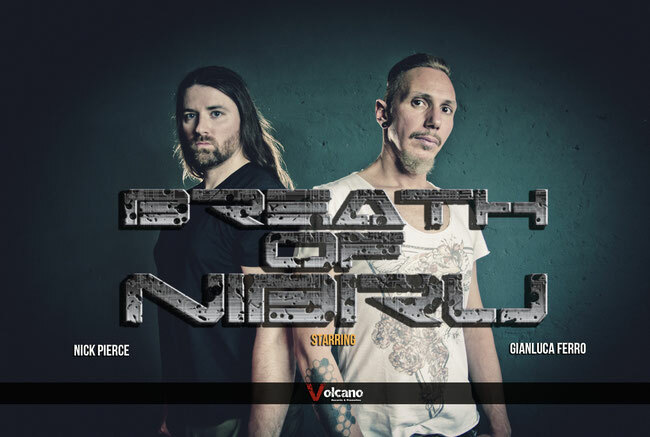 Breath Of Nibiru was formed in 2012 by solo guitar legend Gianluca Ferro (Bouncing The Ocean, Doomsword, Time Machine) and progressive metal drummer Nick Pierce (Unearth, The Faceless, Culling the Weak). This duo blends complex time signatures and heavy groove in to one crushing package, their extremely diverse writing and conceptual approach to flow makes for a cutting edge listening experience. Breath of Nibiru’s newest album “Skyline Bazaar” unveils territory in the metal genre previously unexplored. From Gianluca’s technically astounding solos to Pierce’s drum and bass influenced groove, there’s never a dull moment from start to finish.